As searchers from several nations continue to sweep the Indian Ocean for signs of missing Malaysia Airlines Flight 370, they are using complex technology to pinpoint the “pings” that could be coming from the plane’s black boxes. A company with headquarters in Reston could help them. Metron Scientific Solutions, located at Reston Town Center since 1991, was instrumental in finding Air France flight 447 after that plane went missing in 2009. Metron is scientific consulting firm that develops solutions to challenging problems in national defense, says company vice president Maribeth Dwyer. Officials called on Metron to help find the Air France flight, which disappeared on June 1, 2009 en route from Rio de Janeiro to Paris. Metron’s expertise in applying Bayesian Search Theory to problems, such as the 1968 hunt for the missing submarine Scorpion and the 1986 search for the SS Central America, made the company uniquely suited to the complicated underwater search for the missing plane, Metron says. “Metron’s staff, in particular, Dr. Lawrence D. Stone, have been involved in other high profile searches of this nature,” Dwyer said. “We were asked to assist in the search for Air France 447 by producing a probability map for the location of the aircraft which took account of all available information including two years of unsuccessful search and the possibility that the beacons (or “pingers”) on the black boxes failed to operate. “At the beginning of the third year of search, the French decided to begin their search in the high probability area of the map and found the wreckage within six days of search,” said Dwyer. So far, Metron has not received the call to assist in the search, which is now focusing on 30,000 square miles off of Perth, Australia. However, Dwyer says Metron has spoken with U.S. Navy officials and others involved in the effort. “We stand ready to help should our assistance be requested,” she said. “The technology and hardware being used in the present search is similar to that used during the search for Air France 447. Likewise, the analysis required to apply Bayesian search theory to this problem would be similar, however on a much larger scale. 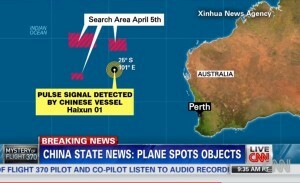 “We, like the rest of the world, are extremely hopeful that the recent pings detected will quickly lead to the discovery of the plane.